While Australia broils at temperatures reaching just shy of 50 deg C (122 deg F) the U.S. and Canada are about to be hit with lowest temperatures for many years as the mercury is set to drop to temperatures colder than the Arctic circle in and around the Great Lakes. The Chicago area can expect temperatures of -44 deg C (-49 deg F) and with the wind chill factor, it will feel even colder. According to AccuWeather, while the midwestern United States has been dealing with bitter cold, an even harsher and more dangerous stretch of cold is expected in the final days of January as the polar vortex plunges south. 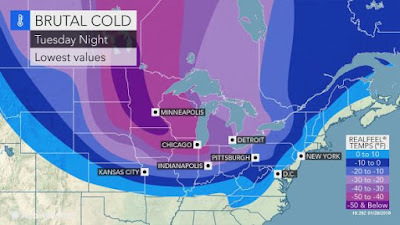 "Through late next week, it will be a very cold stretch with high energy draw from the Plains to the East Coast," according to AccuWeather Lead Long-Range Meteorologist Paul Pastelok. Sunday will bring another day of highs being held to the single digits and teens from Fargo, North Dakota, to Chicago and Detroit, but even harsher conditions can put more people and animals at risk for frostbite and hypothermia during the final days of January. 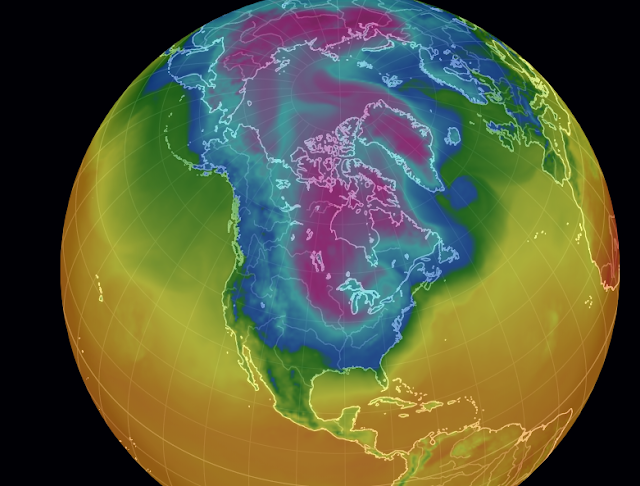 The polar vortex is expected to become displaced from the Arctic Circle and plunge down to near the upper Great Lakes. That will occur in the wake of the winter storm that may lay a swath of disruptive snow from the Midwest to a part of the Northeast early this week. "Temperatures can be held 20 to 40 degrees Fahrenheit below normal across most of the Midwest around midweek.